Designer Sarah Burghard says cookie-cutter design isn’t what independent hoteliers want. While I love the term 'cookie-cutter design', creating a standard look couldn't be further from my ethos as a designer and what I offer the hospitality industry. I am lucky to have the choice. There is a luxury in working directly with the owner and/or final decision-maker, as is possible with a boutique hotel, rather than with one link in a chain of large organisation employees hesitant to take new directions. An initial, informal chat about when and how the hotel began and what they are particularly proud of often turns into a wonderful scramble for a long-lost piece of memorabilia or ignites a story that their guests would love to hear. This creative process is refreshing for my clients, as they are often wary of designers who give the industry a bad name by charging far too much while taking over the vision. Boutique and independent hoteliers are incredibly versatile people who deal with myriad tasks -- everything from the food and the chef to the service, housekeeping, maintenance and garden, plus finance and interior design. Because of this, I find them to be broad-minded people that I believe are intrinsically creative, and I find they truly enjoy bringing this part of their skill set into our collaboration. Clearly, some hotels trade on the consistency of their offering all over the world, and cookie-cutter design may be the only type of creativity they will ever entertain, although I think there is space for individuality in any hotel. The staff aren't clones, so why should the lampshades be? Thankfully, the rise of the boutique and independent hotel means there's an abundance of wonderful places that pride themselves on being unique with their interior styling. But, unique in this capacity lies the skill of bringing together an eclectic mix of carefully chosen furnishings that create the desired ambience. While guests appreciate these aspirational offerings, in reality these products can often be found in similar-level hotels because they are still mostly off-the-shelf. My mission is to take the notion of bespoke one step further and so far my ideas, affordability and provenance mean that this fresh approach is keeping me very busy with some fabulous projects. So what exactly is the bespoke offering I bring to the hospitality industry? Sarah Burghard Designs creates products displaying the hotel's specific identity through visually eye-catching digital textile designs on lampshades, cushions, wallpaper and upholstery. Perhaps the archive, history and story, maybe the location, architecture or internal features, a rather wonderful letter sent from a guest or the wage slip from an employee back in the day when the building was a private house. As a former actress my training and skill set includes storytelling, characterisation and a desire to entertain, which sits very comfortably inside the hospitality industry. The aim is to impart knowledge to the guests about where they are and delight them with the individual story the hotel has to tell. 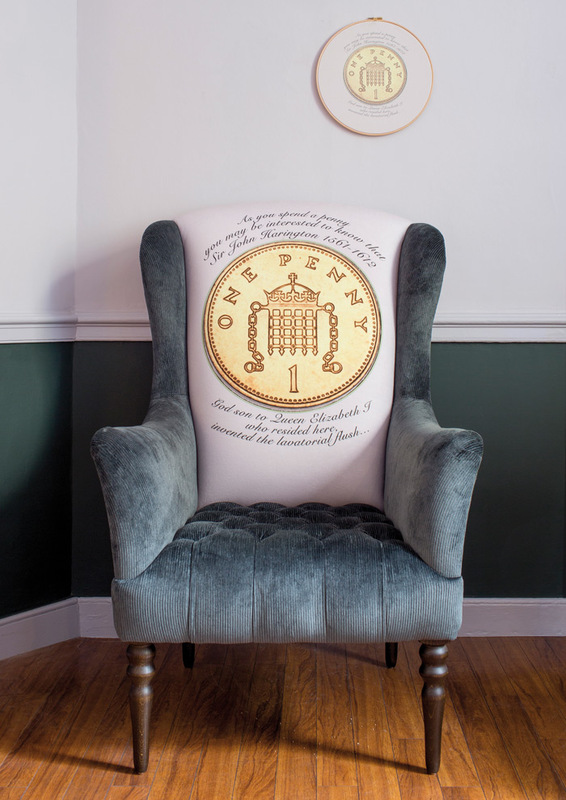 With the word bespoke comes the fear of the price tag, but digital printing means short runs, and individual pieces are now available to the trade at roughly high-street retail prices. One fabulous design can be used on a wide range of interior products, for marketing and promotional materials, perhaps corporate gifts that have meaning. There are further opportunities to develop an own-brand product range to sell on to guests, creating a new revenue stream. I also partner with an expert with 20 years' experience building retail collections for large high-street brands. Our combination of skills is opening exciting new collaborations. While the corporate brands often have the headlines, they can't compete with the unique experience that brand Me guests want to tweet about and share with their followers. Generic is hardly newsworthy, but a truly bespoke design in a beautifully unique hotel most certainly is.